Garlic is a $20 million industry in New York, and it represents an important and growing niche crop across the Northeast. As the numbers of garlic growers and acreage in garlic have increased, the number of diseases associated with this once trouble-free crop have also increased. Nearly 25% of growers surveyed indicated they have lost 30% or more of their garlic crop at least once in the last five years. To reduce these losses and increase productivity, are developing best practices for garlic in the Northeast through a series of research trials. A post-harvest trial compares treatments by examining marketable yield and disease incidence following heated curing, cutting garlic tops and roots prior to curing, and washing immediately following harvesting. A weed control trial compares both organic and conventional options to determine which weed controls are the most efficient, effective, and feasible for organic and conventional growers. A fertility trial compares available recommendations from the Northeast to determine optimal timing and rates of fertilizers. These trials are replicated from the Albany, NY area down to Long Island, providing a diversity of soils, environmental conditions, and hardiness zones which will be applicable throughout the Northeast. Year one results have yielded a wealth of information on post-harvest handling of garlic. Notably, curing garlic in a heated environment, up to 105 degrees, did not cause any damage or increase disease incidence. Year two results will build upon the information learned from year one with post-harvest trials. Fertility and weed control trials have been installed and will be maintained through the 2013 growing season to harvest. Fertility and weed control: The trials were installed in the fall of 2012, so no research results are available yet. The information from these trials will be shared at the 2013 garlic festivals, field meetings, and winter meetings/schools. Post-harvest best practices: Garlic dried extremely well this summer due to hot, dry weather during July. All garlic dried quicker than usual; however, in the high tunnel it still dried faster despite the ideal outside conditions. 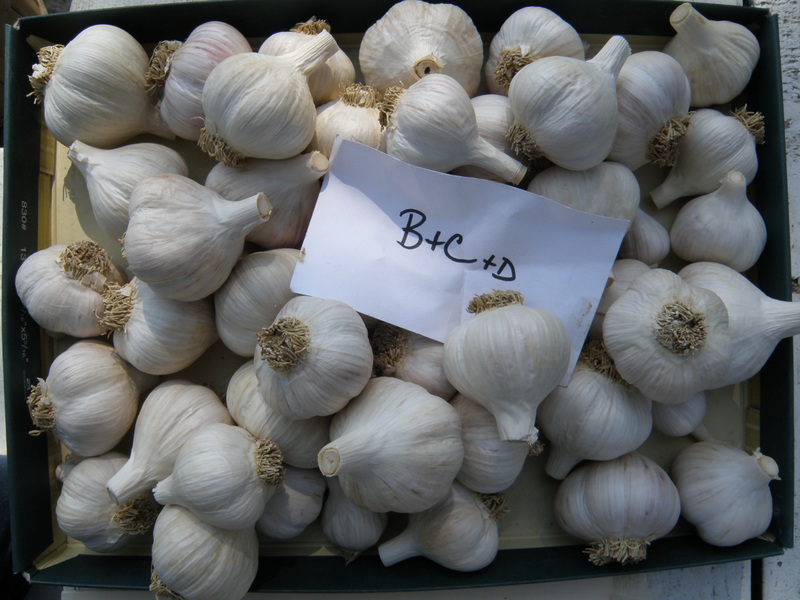 In the conservative high tunnel conditions of our grower cooperators, which were only approximately 10 degrees warmer than the outside, garlic still dried 2-3 days faster and had slightly higher quality and less disease incidence. A grower who adopted high tunnel growing and increased temperatures to 110 degrees, or approximately 20 degrees above the outside temperature, was able to dry his garlic completely in 7 days. 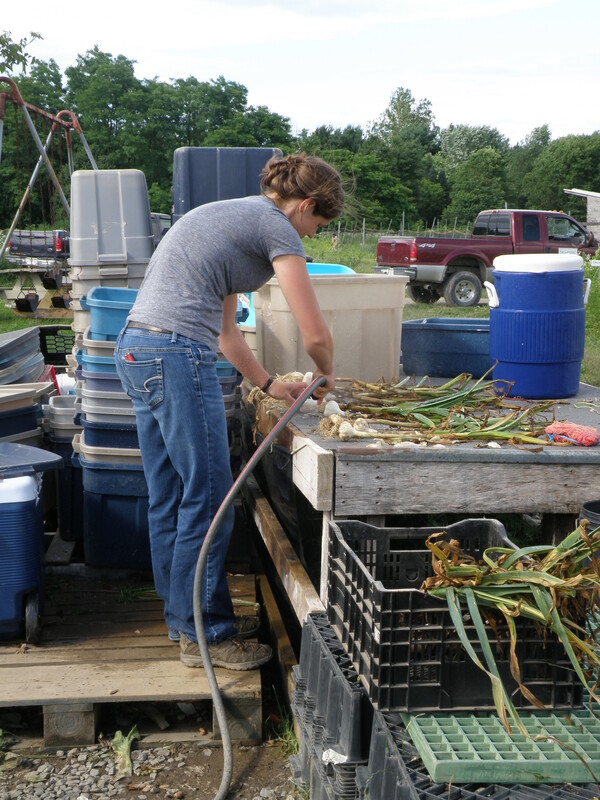 Results of the three post-harvest trials were shared with all vendors at the Saugerties garlic festival, and will be shared at the garlic school, which attracted 92 growers last year, at NOFA NY, NOFA VT, and at the NYS Fruit and vegetable growers EXPO. Adoption and economic impacts will be measured in 2013. 1) 1000 farmers receive 3 articles detailing research findings in the Veg Edge (450 subscribers) and The Garlic Press (600 subscribers in the Northeast). Winter ‘12-’13. 1 article and the research findings handout have been distributed through the VegEdge and the Garlic Press, respectively, reaching approximately 1050 people. Garlic schools were implemented in the early spring of 2012, in three locations across New York. 92 growers attended these meetings, which included information on disease control, garlic bloat nematode, fertility, and grower concerns. Surveys administered at these meetings helped determine baseline levels of knowledge and behaviors prior to receiving research information. Meetings are scheduled for March 19th and 21st of 2013, with even greater attendance expected. The Winter EXPO has an allium school which will detail fertility recommendations, and research results will be shared at NOFA NY and NOFA VT during the winter of 2012. 3) 100 growers receive research trial information at the Saugerties Garlic Festival through CCE and the Garlic Seed Foundation. 65 complete surveys (same as winter meeting survey). Sept. ‘12 and Sept ’13. 100 growers did receive trial information at the Saugerties Garlic Festival. The survey was not completed at the festival; instead it was completed at the garlic schools. 4) 700 growers purchase Cornell Guidelines with new garlic chapter. 150 additional growers access garlic chapter online. First draft complete Sept ’12, second draft with all results complete Sept ’13. The chapter is slightly behind schedule due to the illness of the Recommends’ editor. The chapter will be completed and disseminated separately by March, 2013. 10 growers have received in-depth help implementing changes so far. This part of the project will increase drastically in 2013. Growers have been especially excited by the post-harvest handling information which has become available. Many more growers are considering drying in high tunnels than in the past, and a few have already successfully made the transition. Numbers will be quantified through surveys in 2013. Communication lines are becoming clearer, and more growers are aware of the research happening with garlic every day. 2012 was a good year for garlic, and we are more clearly understanding what it takes to make sure every year is this good, regardless of the weather outside.